Is there anything mango can't be part of? Whoa, I think, holding it up thoughtfully. Should I put it back? I should probably put it back. Now I like food. I like basically every type of food, from every corner of the globe, but in this wide field of vision I do have a blind spot. I’m not much of one for spicy foods. I am what is known as, to employ the vernacular, a chilli wuss. Black sheep of my family, I sit aside sipping mild broth those days when glowing-red bowls of south-asian or mexican cusine are on the table. I love salsa so dearly it’s hard to convey in words, but only if it’s below a certain acceptable level of hotness. Salsa with “kick” is definitely well above that level. In any other case, I probably would have put it back – but it was a mango product, and seeing as how I’m in the middle of a sort of unoffical mango week I just couldn’t put it down. I needn’t have worried – the Helpful Sample Lady, helpful though she was, was also either badly misguided or engaging in some sort of macho mind game with me. This salsa is unequivocably the mildest salsa I have ever tasted. There is only the faintest spark of a spice hidden somewhere inside the fruit medley of the product – a small and harmless old man sort of spiciness, just popping it’s head in the door to wheeze a gentle hello. I couldn’t have been more delighted. In addition to it’s extra-mild taste, this product pushes the very definition of what salsa is. The salsa lacks tomatoes entirely, substituting them out for the juicy and subtly sweet titular fruits. There is a wee bit of onion and chili added to the mix, but that’s about it. The salsa is so chunky that it’s more of an extra chunky pico de gallo than anything. Basically the only thing “salsa” like in this salsa’s nature is the fact that it is a “sauce”. 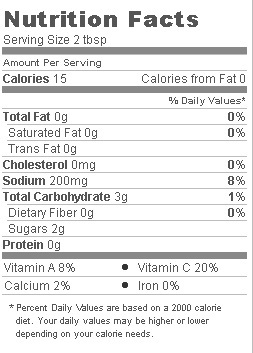 With a slight recipe change this product could easily become a fruit desert. Not that that’s a bad thing. I thoroughly enjoyed this purchase for it’s unorthodox take on things you can dig your chip into. I say, bring on the non-tomato based salsas and let’s see what happens. Would I Recommend It: To mango lovers and salsa lovers alike – just not to spicy salsa lovers. 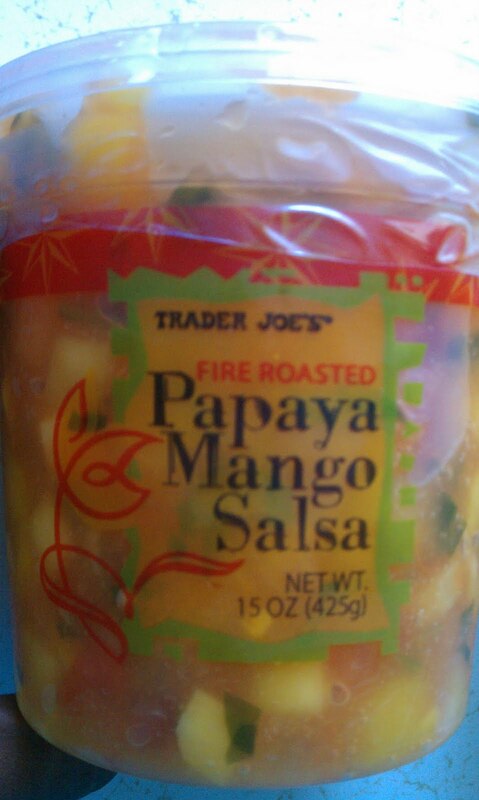 Would I Buy It Again: Next time I want a tropical fruit based salsa.